Welcome to Vermont Haunts!! This is truly your home away for so many vacation plans. From spring skiing to summer rafting to fall foliage to the beauty and serenity that is winter, it is here for your pleasure!! A king master, second bedroom with twin beds, and a new queen in great room awaits you. An updated bathroom and kitchen gives you exactly what you need to relax. There is complementary wifi and 50" flat TV with blueray. Enjoy your all season retreat!! M Bdrm has - King-sized bed. The 2nd bdrm- two twins. Queen-sized pullout in great room. Huge private deck; fully equipped kitchen; gas BBQ grill; DVD player; HD TV, espresso/cappuccino makers. 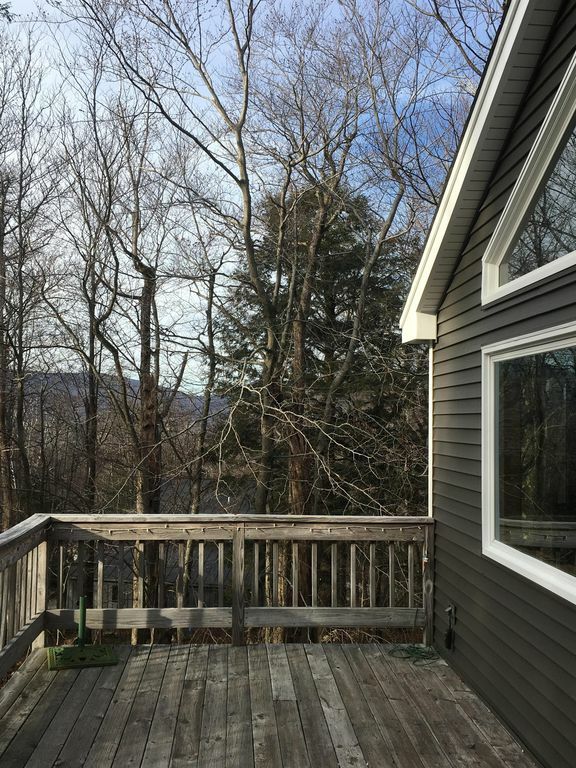 The house is very nice, clean, and convenient to Stratton Mountain. Close to Stratton, close to Manchester, had a great time. A Great Ski House With Everything Minutes To The Slopes A Real Value! Wounderful classic ski home less than 5 miniutes from Bromley. My wife 4 year old daughter and I have been having a fabulous 5 night stay . The open living space with wood burning fireplace is warm and comfortable. Fresh powder, blue skies, great skiing in mid March, I still love southern Vermont. THANKS for sharing your home with us! We had a great stay here. It was a very nice space which was kept very very clean and was well equipped. There are lovely views all around. It is just 5 minutes up the road from Bromley and 20 or so from Stratton. A special thanks to Fred for accommodating us so last minute! My family and I recently stayed at this house and had a great time. The accommodation were just about perfect. The home was well stocked with almost everything we needed. The only issue I had with the house and the reason I didn't give it five stars was that the microwave didn't work and the walkway to the house wasn't shoveled or salted, making it very treacherous getting to and from the house. However, that did not ruin our little vacation and we would definitely stay there again. Perfect location, 5mins from Manchester. The home was MUCH more than I expected. Other than the microwave not working the place was perfect. We will be back! Thank you. Located in Bromley National Forest, 5 minutes from Bromley Mountain, 15 minutes from Stratton Mountain, 5 minutes from the Appalachian Trail, 5 minutes from outstanding outlet shopping and gourmet dining in Manchester. Very comfortable and homey. Great gourmet kitchen. FREE WI-FI. No animals. From $400/weekends +10% Vermont Hotel Tax From $400/weekends + 10% Vermont Hotel Tax Call for other rates No Seasonal rentals!